Usborne Books and More contacted us a few weeks ago about participating in our Toddler Approved Giveaway season and I have been so excited to share their products with you!! Today I am sharing my daughter's new favorite Usborne book by Fiona Watt called That's Not My Angel. Along with this book my daughter and I created a little keepsake craft that I think is pretty cute... and kinda funny too. I'll share how we made it later in this post. Have you read That's Not My Angel yet? Or any of Fiona Watt's other books? Usborne has lots of books for kids of all ages by Fiona Watt... but the "That's not my..." series is one of our favorites. They are touchy-feely board books that are durable, colorful, and fun to touch! My daughter loves this book and it is always in my diaper bag for when we are on errands or sitting in church. My almost 4-year-old son is just as interested in it and I typically find myself with both kids fighting for my lap and a chance to touch or turn the page once I start reading. If you don't have one (or two or three) of these Usborne That's Not My... books at your house, I highly recommend you head over to Nancy's Usborne Books and More online shop and start buying!! Along with reading That's Not My Angel, my daughter and I did a little creating. In honor of her first birthday we did some finger painting. It was quick, it was messy, and she had a blast! While her masterpiece dried, I grabbed some other materials to make the rest of the angel project. Materials Needed: paper plate half, scissors, stapler, pencil, glittery pipe cleaners, tape, and your favorite photo of your child. 2. Roll it into a cone shape and staple it. 3. Trace your child's hands onto the dried painting (or just cut out wings like I did). 4. Tape them to the cone. 5. 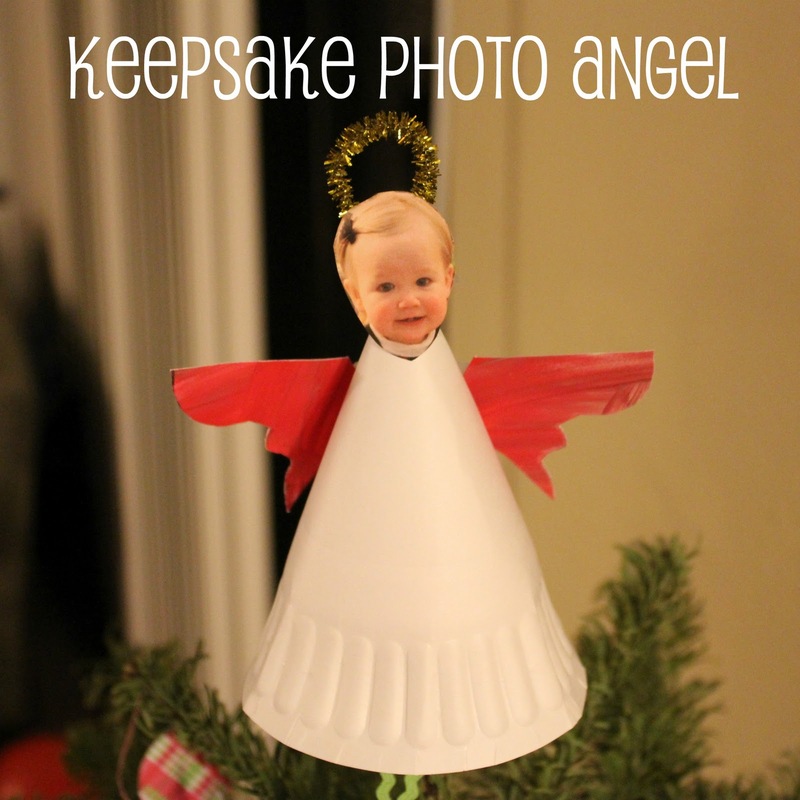 Cut out your child's head from the photo to stick on the top of your angel body. 6. Tape a little glittery pipe cleaner to the back to make your child's halo. 7. Tape it to the top of the angel body... and then place it on the top of your tree! If you have more than one child you could make one for each of them and just rotate who gets to go on the top of the tree! I got the craft inspiration for this project from here. Now every time that I look at the kid's Christmas tree I can't help but smile because the angel looking back at me is so adorable :) I also love that my daughter's first painting experience is part of this little keepsake craft. This book and craft combo is a great way to talk with your child about textures, colors, and simple new vocabulary words like wings. As we read the book we expanded on the text and created longer sentences about each page. For example, instead of just saying the wings were fluffy, we also created sentences about the colors of the wings and what the fluffy wings reminded us of... (cotton, clouds, marshmallows, etc.). This book provides so many opportunities for practicing language skills! We are so grateful to Nancy at Usborne Books and More for sending us this book to review. We are even MORE excited to be giving away a little Usborne Book gift package this Thursday... so stay tuned for more info on that. 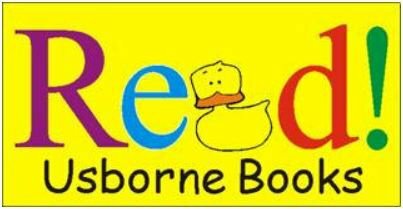 You can learn more about what Usborne Books and More is up to over at the Lucky Duck Books Facebook page. Disclaimer: I want to thank our friends over at Usborne Books and More for letting me review their fabulous product. 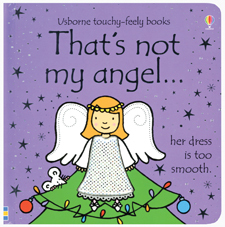 I did receive a copy of That's Not My Angel by Fiona Watt for free from Usborne to allow me to do this review, but I was not paid for this post and the opinions shared in this post are exactly how I feel. Please keep in mind that the opinions expressed in this post are mine and are related to my family. You might have a different opinion. AH! So cute and funny indeed...I LOVE IT!!! They are funny and cute! Any Grandparent or parent would love to put these on their tree! That might just be the cutest thing I've ever seen! What a sweet idea! Ooooh, I looooove Usborne books and this series is wonderful! Your little angel is too cute! That is so adorable! I can't wait to make that with my kids. I do love the "That's not my" books-- we love the dinosaur, truck, and train... I hadn't seen the angel version, what a great addition to a Christmas library!